The deaths in the Jonestown community of northwestern Guyana on November 18, 1978, marked the largest non-natural loss of American civilian life before September 11, 2001, yet the event has been largely forgotten. In Jonestown: A Vexation, poet Carmen Gillespie presents a more subjective version of the Jonestown story than the iconic photographs of the event, which showed 900 plus people, more than 250 of whom were children, laying face down and forever voiceless. Gillespie draws on her own memories of living in Guyana’s capitol, Georgetown, as a child to imagine the hopes, aspirations, and heartbreaks of those who believed in Jim Jones’s vision. Among the issues explored in Gillespie’s poems are the early life of Jim Jones and its effect on his personality, as well as the practices observed in the compound and a sense of everyday life, much of which was filled with laughter and joy. Several poems deal with individual members, including Jones’s wife. One section compares aspects of Elvis Presley and Jim Jones, especially the charisma that both men shared. The collection ends with the unceremonious burial at sea of Jim Jones and the desolation of the island after the infamous events were over. 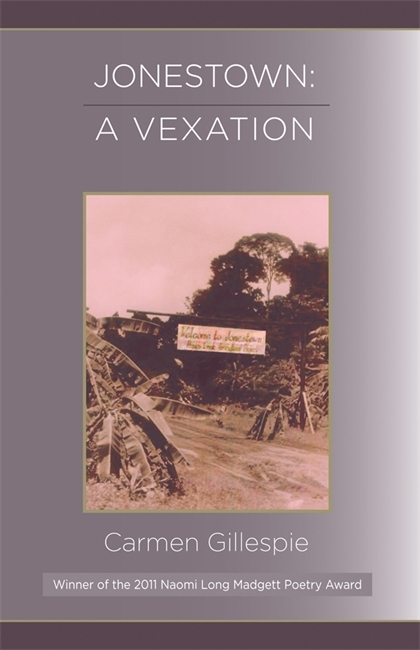 Readers of poetry will appreciate the questions of religion, race, nationality, power, civil rights, sexuality, and identity that Gillespie engages through the enigma of Jonestown. Carmen R. Gillespie is professor of English and creative writing and director of the Griot Institute at Bucknell University. She is the author of the books A Critical Companion to Toni Morrison, A Critical Companion to Alice Walker, as well as the poetry chapbook, Lining the Rails. She is a Cave Canem Fellow, has served as a Fulbright scholar, and has received awards and grants from the National Endowment for the Humanities, the Ohio Arts Council, the Mellon Foundation, the Bread Loaf Writer’s Conference, and the Fine Arts Work Center in Provincetown.